Welcome to The Abso!ute Sound online! We explore music and the reproduction of music in the home. We believe that the sound of music, unamplified, occurring in a real space is a philosophic absolute against which we may judge the performance of devices designed to reproduce music. Our goal is to provide the resources consumers need to judge how a component's sound either honors or departs from the music's truth, and to make sound purchasing decisions that maximize their experience of reproduced sound. Below is our Issue 142, June / July 2003 table of contents and editorial. Wayne Garcia checks out a selection of affordable analog goodies from two veteran manufacturers, Rega Research and Grado Labs. Our latest Recommended Products list features the best amps of every kind. One from the vault—Harry Pearson’s fabled hybrid of Magnepan bass and Infinity mid/tweeter panels: the legendary QRS-1D (from Issue 13, 1978). Nine—count ’em—nine carefully considered audio systems from $1700 to…don’t ask! A report on that often-overlooked component, the FM tuner. Neil Gader compares models from Arcam, Classé, and Magnum Dynalab, while Robert Harley deciphers all the specs, and tells you which ones really count when you lay down the green. Dan Davis checks out this affordable chameleon from Philips. Good things do come in small packages, at least from Audio Physic, says Neil Gader. Robert Harley listens to some serious, and seriously affordable, new tubed gear from ARC. From Finland, a pair of small, active monitors. Robert E. Greene reports. Sue Kraft on the latest from famed designer John Curl and the folks at Parasound. just what constitutes “good” sound. 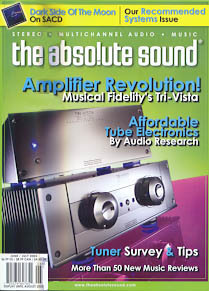 Chris Martens explores Musical Fidelity’s top integrated offering. Goldmund is back in the U.S., and how! Jonathan Valin takes a first listen to the company’s top o’ the line—and, um, very expensive—DAC. Part One of HP’s Super—and is it ever!—Component List, plus a listen to The Dark Side of the Moon on multichannel SACD. Diving into the uncompromised sounds of 13 African discs, Greg Kot explains why Nonesuch’s Explorer Series is the best overview of world music ever attempted. Plus, reviews of Aterciopelados’ Evolución and Ry Cooder’s Mambo Sinuendo. The second installment of On the Fringe examines exciting new releases from Yeah Yeah Yeahs, Th’ Legendary Shackshakers, The Raveonettes, Califone, The Fruit Bats, Ian McCulloch, and Yo La Tengo. Harry Pearson reflects on the story behind this issue’s 30th Anniversary feature.